They run them on sale @ ~$280 a few times a year, so I'll probably wait until the next sale, but I'd love some input on whether a 24" brake is large enough? It seems like price goes up exponentially above 24". Also a 24" brake is (barely) light enough that I can move it onto the workbench when I need it and then put it away when not using it, whereas a larger brake would be taking up bench or floor space permanently. Thoughts? It offers good adjustability and functions good. That looks like a great size for panel work. Do you miss not having box and pan capability? I think it depends on what all you plan to do. I have the harbor freight 30 inch one. You can do a lot with it, but it obviously has its limits. It is inexpensive though. I have a rolling table I mount it to when I need to use it and take it off when I don't. LS1, TKO600, IRS, no scoop, undercar exhaust. Delivered June 14, 2017, First start December 31, 2017. I have found jobs where the box and pan option was needed. It is a plus in doing the boxing jobs. Depends on what you need to do. I have a 48" brake (heavy duty industrial type) that I've been using and abusing for four decades now. It does 98% of what I need for typical automotive work. Occasionally I have to take work to a shop with larger equipment when I have panels that exceed the capacity of mine (too wide or too thick). A 24" wide brake would significantly increase the number of items I'd have to farm out. However, there are times like today that I wish I had a much smaller light duty brake that I could make bends closer together. If money is a driving force for purchasing a smaller brake I suggest you look at industrial equipment auctions. There are some very good deals out there on premium quality heavy duty equipment and good equipment will last a lifetime. My boys will inherit some great shop equipment that is older than they are and they will be able to pass it down to my grandkids (who will probably sell the stuff at an antique auction to buy video games). Whatever you decide, I suggest you buy a pan brake as it is much more versatile and there are tricks that allow you to make very smooth bends with a pan brake. If you want to make brackets, then I think you'd want to use 16ga metal and the eastwood unit is only good to 20ga. I recently made a power steering cooler mount for my Mustang project and 20ga just wasn't stiff enough and my cheap HF benchtop break wouldn't do the 16ga, so I wound up bending the metal with a hammer and the edge of the table. If you're using the box capabilities of the Eastwood unit, then you probably would use 20ga for that type of project. So unless you spend bigger money for a better tool, you probably won't find one of the budget models that will do all you want. I own both the Eastwood and HF breaks mentioned here. I use the Eastwood box break probably about 80% of the time. I will bend 18ga pretty easily but 16ga is a real challenge for it. The HF tool does simple bends in 18ga easily. As everyone has said here, it just depends on what you are attempting. I got through the build of my 289 FIA pretty easily with the Eastwood break and a good vice and a hammer for thicker aluminum and steel. I also have the HF special. It is pretty rough, but will do the basic stuff. Space and budget allowing, and if you are going to do a decent amount of fabrication work, box and pan capabilities would be nice. 24" would probably get you into the 90 - 95% of the time range. I looked and the price jump to 48" is pretty hefty. Tried the HF 36" first - found I had to have a pan + box brake. The 24" Eastwood looks pretty good at the price - I see their 48" model is almost double the Northern but maybe they go on sale too (and might might be well worth it). Thanks everyone. Lots of good points being made here. I'm OK with spending what it takes to buy a tool that meets my needs (buy it nice or buy it twice). The trick is being honest with myself on what capabilities I truly need. Ideally, I'd buy a 48" box and pan brake that can handle 16ga or even 12ga. These seem to be in the ~$1500 (16ga) to ~$3300 (12ga) range. I have no doubt that I could do everything I need with one of these. However, I'm also somewhat space-limited, and having a tool that large that I use pretty infrequently taking up a lot of shop floor space is less than ideal. The 48" Eastood brake still only handles 20ga steel. Spending $800 on that tool and then realizing it still doesn't meet all my needs would be a bummer. However, if the $280 24" Eastwood brake can meet 80% of my needs and not take up a ton of space, that may be OK. I wouldn't feel as bad adding a second brake to the basement down the road if I've only spend a couple hundred bucks on the small Eastwood brake. I've got some time to mull this over a bit more, as I'm still a ways off from needing a brake, but I appreciate everyone's input. It's really helped me to clarify my wants/needs. There's this one too from HB. Shear, brake and slip roll. Found that especially the shear part is handy for making quick straight cuts. If you need a brake you also need a shear so plan accordingly. I use mine a lot -- all day for the last two-days and all day tomorrow for sure. Again, your best bet is to search used machinery sales and auctions as you can pick up good quality used equipment for pennies on the dollar. If you want it to look new -- paint it and tell everybody it's new. A 50-year old industrial strength shear or brake in good condition will cost about what a Chinese made super light duty one will and perform much better. I know, you only plan to use it so infrequently... Once you have the tools you'll find lots of projects. Thanks NAZ. I honestly have no idea how I would even go about finding an industrial equipment auction around me. Any suggestions? If you don't mind, explain to me the benefits of a shear over those other approaches? John - I've considered that tool (from various manufacturers) on more than one occasion. Most reviews of it say that it's fine. Not great, but OK. Honestly, I don't know when I'd ever need a slip roll, and the fact that the brake can only bend to 90 deg. seems a little limiting. In general, I'm always a little leary of 'combination tools' as they seem to do everything just OK but nothing particularly well. Curious to hear your experience with it. I wouldn't say you "really need" a shear, but I have to say, my ancient 30" Pexto stomp shear was some of the best money I ever spent on a tool. None of those other cutting tools or methods will easily let you cut long, straight lines in .040 aluminum, without warping or bending it, quite like a good stomp shear. I've never used the 3-in-1 devices that John mentioned, but I'd look closely at them if space were tight. Also, I would go with a straight "bench top shear" over the throatless shear linked above. You can cut some pretty thick stuff with them, and I really like the safety compared to pneumatic cut-off wheels. They also don't heat up and potentially warp the metal, unlike an abrasive method of cutting. And while don't fully take the place of a stomp shear, you can make decent cuts, well in excess of the 8" or 10" blade length, if you are careful with how you feed the material into the tool. Last edited by Jacob McCrea; 01-25-2019 at 04:42 PM. Check craigslist in your area and also look around for someone in the business of machinery moving / installation (called a "rigger"). 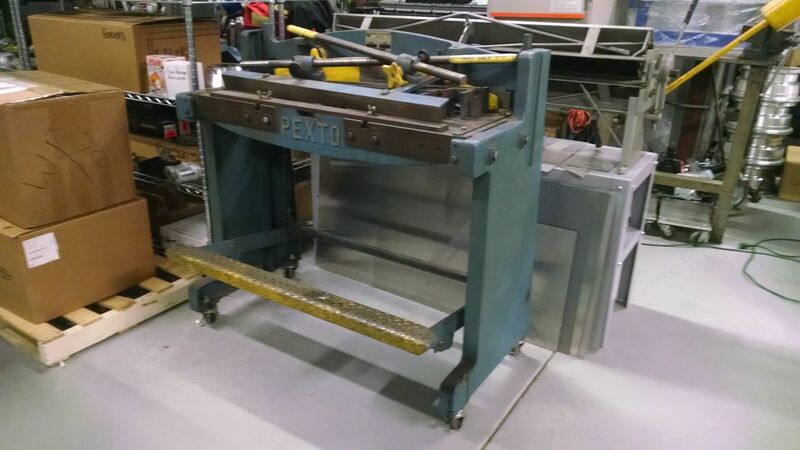 I found my 36" Pexto foot shear on craigslist - it was owned by a local guy who didn't use it much and had owned it for the past 30 years. It was produced sometime in the late '70s, so not as old as some of my machinery, but still a classic. I paid $1k for it, which is the going rate for similar shears in my area. The brake was found by a friend who owns a rigging company - he was moving some seriously huge machinery for a company that was moving to another state and the brake was in their tool room. It was small enough that they didn't want to bother with moving it, so he got it for me for just $300. I added the stand (behind the shear in the first pic) for another hundred bucks. This is all great quality old-school stuff that will serve me well for a lifetime, and then go on to serve another owner for years to come. If all you're doing is making brackets & mounts, you can probably buy the material you want from onlinemetals.com. Here's an example I used for making a bracket for my brake/clutch reservoirs: https://www.onlinemetals.com/merchan...=62&top_cat=60. $300 will buy quite a bit of material, even with shipping. I expanded the passenger foot box, dropped the upper & lower trunk, & made a custom storage behind the seat cubby with the 30" Harbor Freight brake and a Bosch jigsaw. I used the straight edge of some scrap OSB as a guide for the jig saw to keep the cuts straight. It would have been nice to have a box/pan capability, but I just made corner pieces & riveted the faces to those. Once covered by carpet, you'll never know. John, that shear in the photo you posted is a Beverly shear -- a very useful tool for scroll cuts much like giant aviation snips (a hand held tool some folks still incorrectly call tin snips). 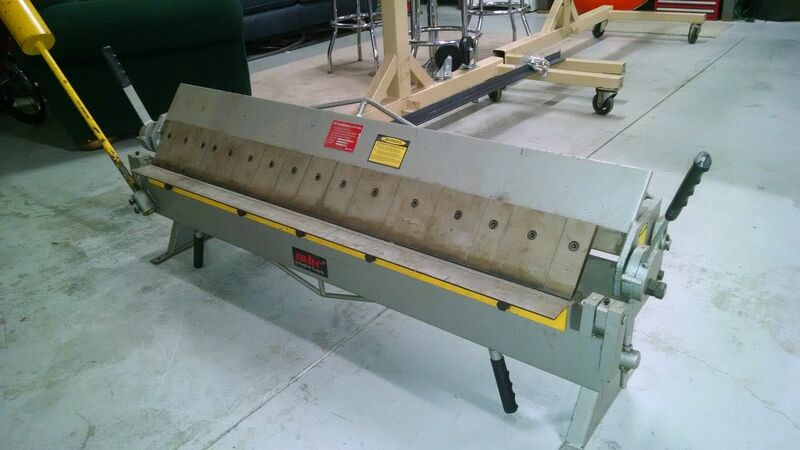 A sheet metal shear will make nice clean straight cuts without warping the metal. You just can't make cuts like that with any saw and will save you a lot of time trying to clean up a rough edge from a saw cut. A stomp shear is probably good enough for most projects. I have a pneumatic shear and it will cut 1/8" aluminum which is very handy for my needs. Look at sites like Craigslist or search the internet for used machinery for sale. There are companies all over the country that specialize in moving (as in selling) used equipment. Gov't auctions are another place to look. Racingjunk.com, Ebay, etc. Good luck. Last edited by NAZ; 01-25-2019 at 09:10 PM.